Investment pundits and gurus have been pouring over an interesting chart, reproduced here, that was published last year in the Financial Analysts Journal. 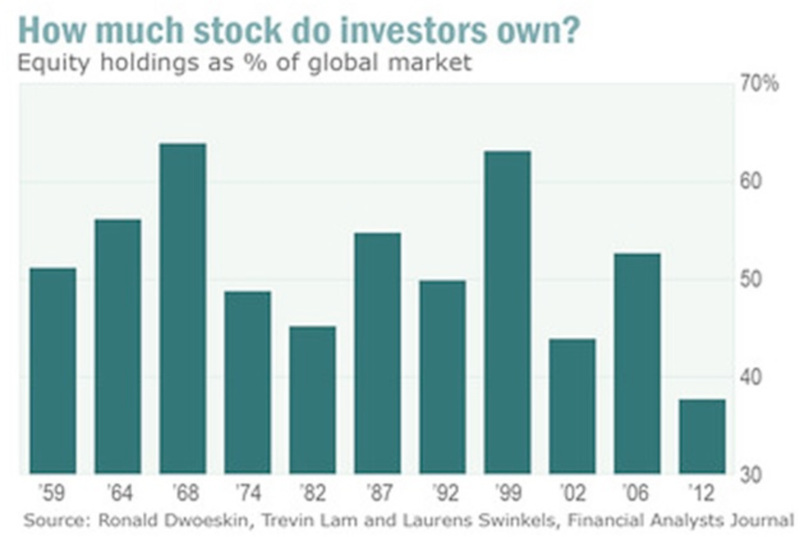 The chart shows that, despite the recent high returns for stocks, investors, in aggregate, actually held only 37% of their portfolios in stocks at the end of 2012. Followup research has shown that even with five-year returns of 18% or more since the Great Recession of 2008, that percentage has hardly budged. If you want to translate these statistics into real money, the research strongly suggests that many people didn’t reap the full benefits of the recent stock market boom, and their portfolios today hold far few stocks than in 1959, when the data-set begins. What’s going on? You can see a few clues from the chart itself. The stock ownership percentage went down dramatically from 1999—when equities made up a near-record 62% of the average investor’s portfolio—to 2002, when the Tech Wreck market decline sent investors scurrying to the sidelines and drove stock allocations below 45%. These timid investors moved back into the market over the next four years, taking their equity allocations above 50%, just in time for the market to crash all over again. “Twice burned, quite shy” is one explanation for why so many investors have missed out on the strong returns we’ve experienced recently. Many have moved into bonds, which currently make up 57% of the aggregate investor portfolio today. In addition, an unprecedented number of other investments are competing for space in an investor’s portfolio—certainly more today than in the 1960s or 1980s. Hedge funds and private equity firms now hold 9% of investors’ aggregate portfolios. Gold and commodities have become increasingly popular investments, as have real estate investment trusts. The markets are impossible to predict, in part because the behavior of people—in aggregate as well as individually—is impossible to predict. But it is possible that the high fees and disappointing returns of hedge funds might cause some investors to rethink some of their more exotic allocations, and any rise in interest rates could startle the investor herd away from their record-high allocation to bonds. One possible future scenario would have the next data point on the chart show a return to stocks. Since higher levels of demand are one engine that drives stock prices higher, we could experience more years of high returns, which could, in turn, bring about one of those cycles that feeds on itself. Until, of course, the next downturn—which, alas, is also unpredictable. The tragedy is how many people have largely missed out on the recovery returns since 2008. It is the nature of markets that they frighten people off while long-term investors enjoy their best years, and lure people back in as stock prices are just about to go over a cliff. The first part of this unhappy tale seems to have played itself out as usual.